The free support group is being launched by Katja, the sister of an anorexia patient, and supported by the German Neuroscience Center. It should help families of people who suffer from anorexia nervosa and associated eating disorders. After watching her sister suffer from an eating disorder for 20 long years and not being able to do anything about it, Katja Geiser, thought it was high time she shared her feelings as a family to help others who were in the same spot as her. The Swiss national, resident in Dubai for three years, has launched a UAE support group for families after seeing her sister go through anorexia nervosa for 20 years. “I could see her and do nothing about it,” Katja said while speaking to Khaleej Times. According to the National Eating Disorder Association, up to 70 million people suffer from eating disorders worldwide. 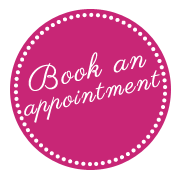 Approximately 50 per cent of those with anorexia nervosa make a full recovery. “For as long as I can remember I knew my sister had issues with food, but it was only recently that I was able to accept she’s anorexic and allow myself to see her condition for what it is,” she said. She also said that her sister did not understand her condition. “I am very close to my sister but it was difficult to tell her what was going on,” said Katja. “Over the years, the situation has had a profound impact on our family in so many different ways and my parents and I have all struggled with emotions we’ve found difficult to deal with. One of the worst things is feeling powerless to help someone you love and acknowledging that the person suffering needs to help themselves,” she added. 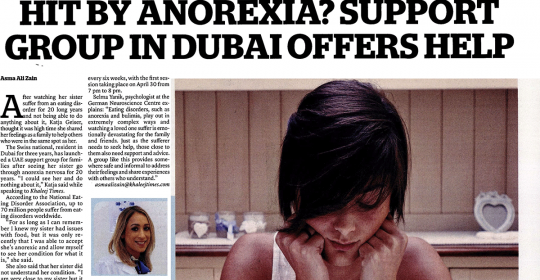 The support group is being launched in Dubai, to help the families of people who suffer from anorexia nervosa and associated eating disorders. The free support group is being held at the German Neuroscience Center in Jumeirah Lake Towers every six weeks, with the first session taking place on April 30 from 7 pm to 8 pm.